The Carlisle Brass 42mm Diameter AQ41 Standard Escutcheon PVD Stainless Brass is to be used with a 3 or 5 lever mortice deadlock or sashlock; some of these can be found in the related products or in the Hinges, Locks & Latches category. This escutcheon is made from solid brass. 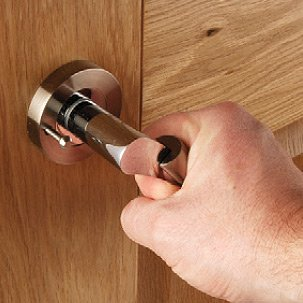 It has a PVD stainless brass finish which is to match the Carlisle Brass door handles and knobs on rose. PVD Stainless Brass is a finish which has a unique 25 year guarantee. Stainless brass is produced by a process known as physical vapour deposition (PVD). In laymans terms the process involves chrome plating, with zirconium, in a vacuum chamber at high temperature. The resulting finish is a highly polished brass look, which is impervious to oxidation or tarnishing.